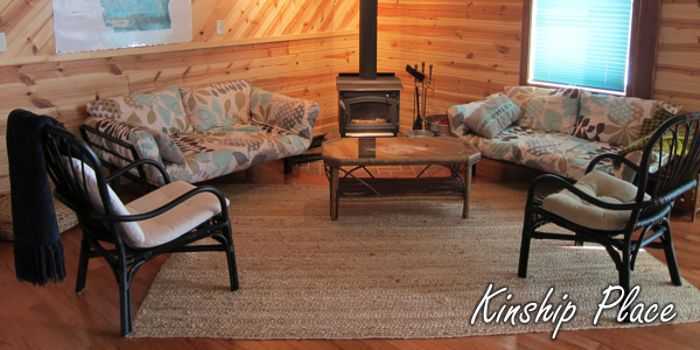 Rent a cabin for a special vacation, or plan a gathering in our inviting meeting space. 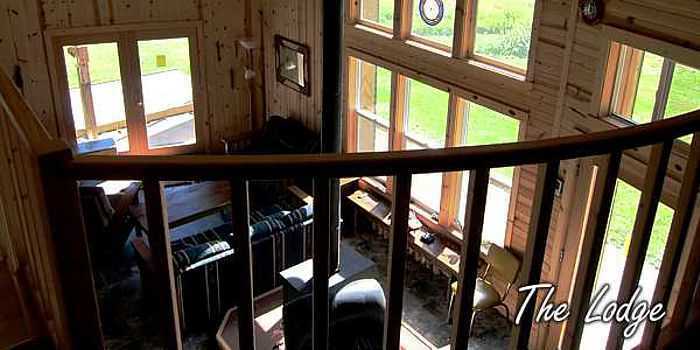 The Lodge is a perfectly versatile spot. How can a place with 8 beds be cozy? 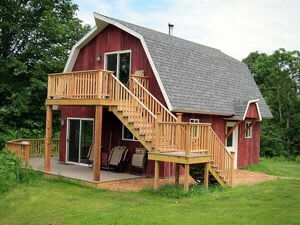 With two bedrooms tucked away and a sleeping loft, that’s how. 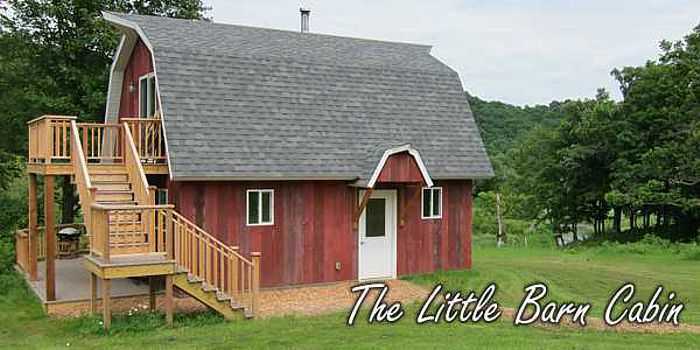 Our Little Barn Cabin’s design is compact and efficient, a thoroughly modern space with a rustic feel inside and out. All natural wood interior, expansive yet warm-feeling, Kinship Place is a wonderfully versatile space for a business or family gathering, or for an intimate weekend getaway. RELAX in private, amenity-filled cabins with big panoramic views. GATHER at Kinship Place conference facilities for your business meeting, retreat or family reunion. 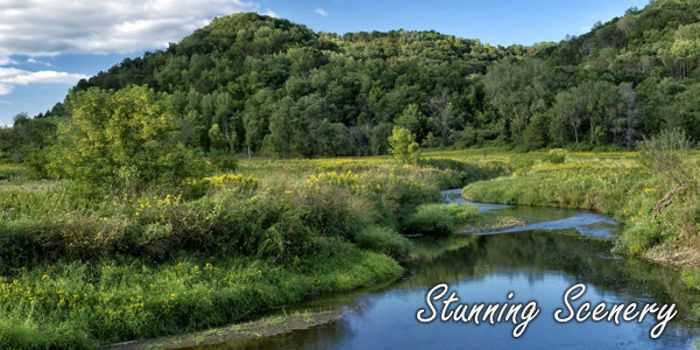 ENJOY the unique beauty of the Driftless area and simply being in this geologically ancient, bio-diverse West Fork of the Kickapoo Valley. PARTICIPATE in a wide variety of seasonal outdoor activities - hiking, bird watching, fishing, kayaking, skiing, cycling and more. 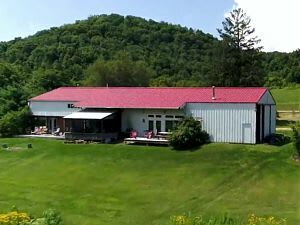 Situated on the West Fork of the Kickapoo River in the geographic center of the Driftless Area's 24,000 square miles of unique topography. 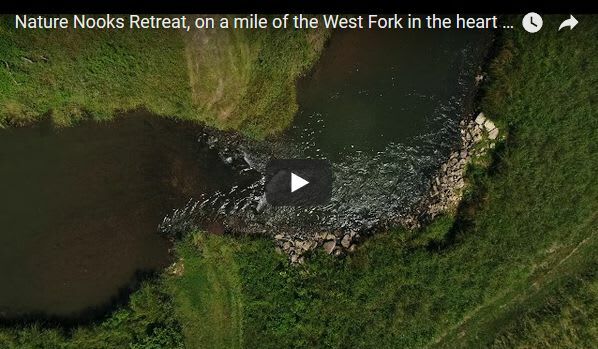 Easy access to countless spring-fed streams in an area known as the center of cold water flyfishing heaven in the Midwest. Ten miles from the Kickapoo Reserve, 8,400 acres of wild recreational land with biking, hiking and skiing trails along the Kickapoo. Recreation areas of the Mississippi and Wisconsin Rivers within easy access. 45-minute drive from the Sparta-Elroy bike trail. Premier bicycling on quiet, well-maintained roads available right from the cabin doorsteps. Amish artisans and shops nearby. 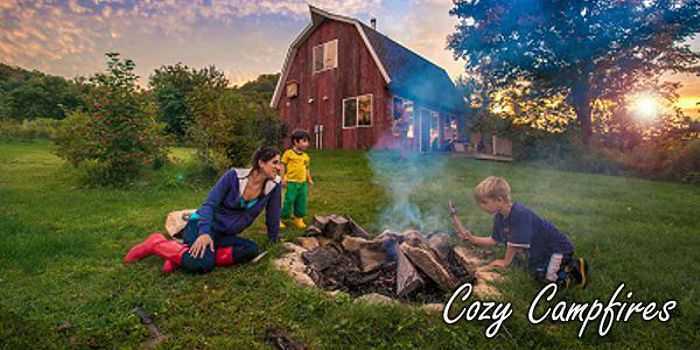 Nearby Viroqua has it all - Farmers Market, shops, restaurants and the renowned Driftless Cafe and the Viroqua Food Coop. OUR CHARTER is to protect and enhance biodiversity and carrying capacity, and to create a means of sharing an appreciation for and a sense of belonging to Nature. To this end, we have recently placed a permanent conservation easement on the property through the Mississippi Valley Conservancy, which will protect this unique place in perpetuity. NEW! Our newly "constructed" wetland, with native plantings in progress, will be a haven for wildlife of all kinds. And we recently added 6.5 acres of newly planted prairie. 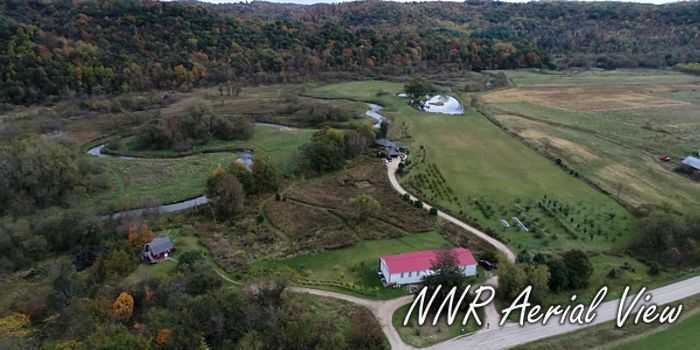 Follow our progress on facebook and our new blog we call the NNR Journal. No matter the season, the quiet and diverse beauty of Nature Nooks reminds us of our connection with Nature and can restore the Spirit. 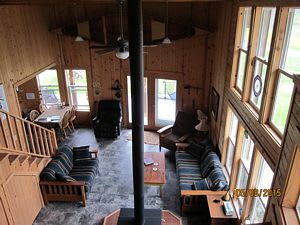 Page Summary: Nature Nooks Retreat offers vacation rentals, conference room, fly fishing, cabins for rent and getaway cabins. Services such as cabin rental, rent a cabin, meeting rooms, resorts as well as cheap cabins are also part of the scope of our business. 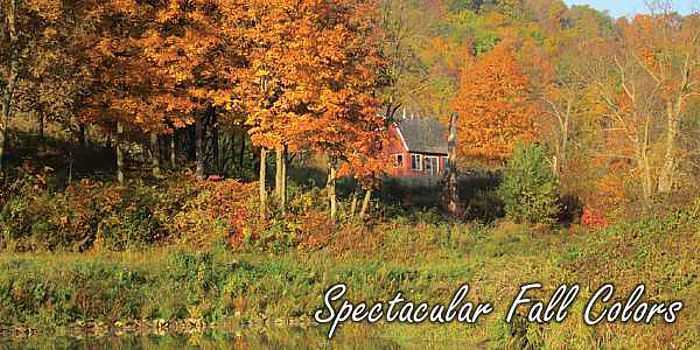 We also specialize in meeting space, rental cabins in Viroqua, Westby, Kickapoo River as well as Southwestern WI. 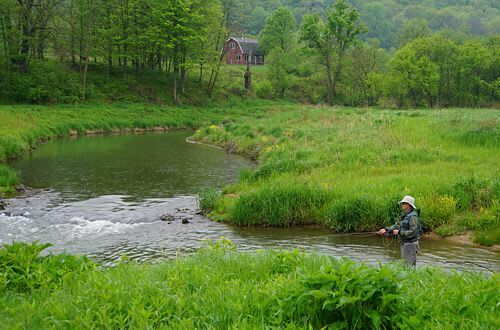 Other areas we serve include the Driftless Area, West Fork of the Kickapoo, Kickapoo Valley and beyond.